Formula One Circuits from above with Google™ Earth gives the reader the perfect insight into what makes F1 the most exciting and dramatic of all forms of motorsport. The unique photography provided by Google™ Earth show each circuit's challenges and why only the very best drivers in the world can thrive in Formula One. Television cameras (even High Definition and 3D) flatten and foreshorten racetracks making them, if not featureless, then apparently undemanding. If you were to sit at the Eau Rouge section of Spa-Francorchamps in Belgium, walk up to the Casino from the harbour at Monaco, or look out onto the desert at Sakhir, you would quickly realise that these are serious challenges - each entirely different from the other. 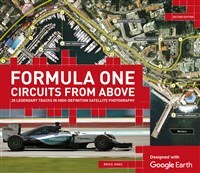 Stunning photography and insightful and thoughtful writing from one of the world's most travelled Formula One commentators, make Formula One Circuits from above with Google™ Earth a fantastic volume to have by your side when you watch the F1 World Championship unfold. The colour, drama, history and excitement of Formula One will never be better displayed in this exceptional volume. Bruce Jones, a former editor of Autosport magazine, is one of the most respected commentators and reporters on the motor racing scene around the world. As well as the best-selling yearly BBC Sport Formula One Guide, Bruce has written numerous other books, including Formula One: The Illustrated History, The Treasures of Formula One, and the yearly BBC Sport World Formula One Records.